TORRANCE, Calif., Jan. 29, 2019 /PRNewswire/ -- As Hurricane Michael approached the Gulf Coast on October 10, 2018, service members and their families assigned to Tyndall Air Force Base, Florida, waited anxiously in evacuation sites, dreading the damage that might be caused by the Category 4 storm. Within 12 hours of Hurricane Michael striking Panama City, airmen from the 36th Contingency Response Group (CRG) at Travis Air Force Base in California filled a C-17 Globemaster III with food, water, and a Basic Expeditionary Airfield Resource (BEAR) package, and deployed an airfield assessment team to restore runway operations. 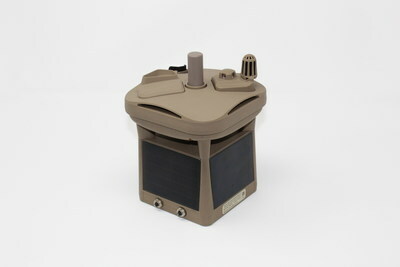 A critical piece of equipment in the BEAR package proved to be the Intellisense Systems, Inc.'s (ISI's) Micro Weather Sensor™ (MWS™). Before departure, the loadmasters asked each team to cut supply weight while maintaining the required capability for their mission. With their existing Tactical Meteorological Observing Systems weighing nearly 200 pounds and filling an entire pallet of 5 cases, the CRG Weather Superintendent decided to bring ISI's MWS instead, due to its small size, light weight, and solar power capability. Since the MWS weighs less than 4 pounds and fits in a small case, it allowed more than 180 pounds of additional resources to be added towards the relief effort. Hurricane Michael destroyed the power grid at Tyndall Air Force Base, and its airfield weather sensor was non-operational upon the arrival of the CRG. Within minutes of boots on the ground, the MWS reported ground observations and transmitted panoramic images to the Department of Defense and National Weather Service networks. For nearly 72 hours, without a glitch, the MWS provided the only ground weather observations in support of aviation resupply efforts. With its two-way satellite communications and solar-powered battery operation, the MWS was the only solution for weather data at the devastated airfield. The sensor's reliability also allowed the CRG ground weather personnel to provide additional support efforts since zero action was needed to maintain and operate the sensor. ISI's President and Chief Operating Officer, Frank Willis, said, "ISI is pleased that the MWS demonstrated and proved its value in support of this critical contingency response. The ability to provide uninterrupted weather observations during the disaster relief effort meant getting supplies directly to those families in need." After three days of continuous weather observations in support of the CRG's efforts, the MWS successfully completed its "first-in" ground observing and reporting mission. Intellisense Systems, Inc. (www.intellisenseinc.com) is an advanced technology company headquartered in Torrance, CA. The company provides engineering solutions for sensor, optoelectronic, augmented intelligence and visual displays for the U.S. government and commercial markets. Intellisense Systems, Inc. is best known for its lightweight, unattended Micro Weather Sensor™ that delivers localized weather conditions anywhere it is deployed in the world.